Geothermal is a “green” renewable energy technology that can help us reduce our carbon footprint and environmental impact as well as help us save money by lowering our utility bills. Geothermal heating and cooling is steadily gaining in popularity as a renewable energy source since it has several key advantages over more conventional forms of heating and cooling. 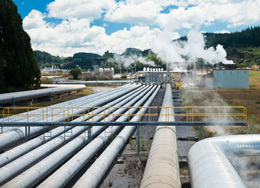 Geothermal energy is quickly becoming a highly effective way to reduce peak demand for energy and lessen our reliance on more conventional fossil fuels. Almost the entire surface of the Earth is full of heat, from the solar energy it receives directly from the sun to the immense heat of the Earth’s core which travels upwards through the crust to the ground surface. A Geothermal Heating, Ventilation and Air Conditioning or Geothermal HVAC System uses the Earth’s natural thermal energy stored beneath our feet to supply the heating and/or cooling to our homes and work spaces by using Geothermal Heat Pumps. A Geothermal Heat Pump, also known as Ground Source Heat Pumps, (GSHP) can be one of the most cost-effective and efficient ways to heat and cool our homes or buildings. Heat pumps are simple electrically powered devices that can supply more energy than they consume by extracting the stored energy just below the surface of the Earth. The amount of stored energy that can be extracted from the Earth depends on your local climate and soil conditions, as well as the available land area as some geothermal HVAC installations, a horizontal Earth loop installation for example takes up a lot of ground space. Generally, ground temperatures are greater in soils and areas with a high moisture content or around major fault lines and fractures which provide the means for circulation of cold water to depths where it can be heated by the normal geothermal temperature gradient of the Earth. This geothermally heated water is then returned to the surface under natural forces to form warm geothermal pools and springs. In each case, at a depth of just a few feet below the subsurface, the soil temperature varies very little throughout the year. A Geothermal HVAC System operates by using two types of heat transfer: Convection and Conduction. In heating mode, a closed-loop ground source heat pump provides winter time heating by extracting heat from the moisture in the ground by means of conduction (conductive portion) into a fluid, usually antifreeze, contained in a buried high-density polyethylene or polybutylene plastic tubing as this pipe does not rust, rot or corrode, and is inert to chemicals normally found in soil. In theory, heat can be extracted from any source, no matter how cold, but a warmer source allows for a higher energy efficiency. A liquid-to-air heat exchanger within the geothermal HVAC unit transfers the heat of the system to the warm air stream (convection portion) inside the home or building to replace traditional forced air furnaces and central air conditioning systems. In the cooling mode during the summer months, the process can be reversed so the heat pump extracts the heat from the warm air circulating inside the home or building (convection) and transfers it back to the soil outside (convection). Transferring the heat to a cooler space takes less energy, so the cooling efficiency of the geothermal heat pump gains benefits from the lower ground temperatures. Then we can see that a geothermal HVAC system uses the Earth as a heat source in the winter and as a heat sink in the summer. The installation of the thermal piping, known as the thermal collector, in a geothermal heat pump system depends upon the location and the available land space. There are several basic types of Earth coupled thermal collectors or ground loops from horizontal to vertical and from open to closed, with the most common type being the horizontal closed loop as it is the easiest and cheapest ground loop to install. The geothermal horizontal ground loop is best for those who have plenty of available land, since the pipes used in heat transfer are spread out, taking up a lot of land area. Trenches are dug in the area surrounding the home with a single heat transferring pipe laid out horizontally at a depth of 3 to 5 feet (0.9 to 1.5m). Shallow horizontal heat exchangers experience seasonal temperature cycles as the incident solar energy changes throughout the seasons resulting in heat gains and losses to the ambient air at ground level. These temperature cycles lag behind the seasons due to thermal inertia, so the geothermal heat loops can harvest heat deposited by the sun several months earlier. The most common type of horizontal loop is called the slinky-style loop, also called a spiral loop. Its given the name because of its spiral, slinky-like design where the horizontal closed loops or pipes overlay each other. The advantage over the straight horizontal loop is that it loops the pipe around the trench, taking up less ground space. Slinky coil trenches can be anywhere from one third to two thirds shorter than traditional horizontal loop trenches. The vertical bore hole, on the other hand, uses a much narrower trench since the pipes forming the thermal collector are run vertically in the ground. This method of geothermal heat pump technology is used when the available land area is small or when the soil conditions are too shallow for trenches. Multiple holes are bored vertically down in the ground, about 10 feet apart and up to 400 or 500 feet (120–150 m) deep. The thermal pipes are installed in pairs in each hole and are joined together at the bottom with a U-shaped cross connector. The vertical pipes are then connected to a header system horizontally just a few feet below the surface. The vertical bore hole is then filled with a special thermally enhanced grout which surrounds, buries and seals the pipe to provide a thermal connection to the surrounding soil or rock to improve the heat transfer. Separate loops lengths and pipe sections whether horizontal or vertical are generally joined together by thermal fusion which involves heating the pipe and fitting, then connecting them to form a joint that’s stronger than the original pipe. This is to ensure that the ground loop is absolutely watertight to protect from leakage and contamination because once buried, any leak in the pipework will be expensive to find and repair. A Geothermal Heat Pump can provide you with heating in the winter and cooling in the summer and uses less energy than most other central heating and cooling system with a typical geothermal ground source pump unit being 20% to 40% more efficient than conventional air conditioning systems. But they are not cheap to buy or install. The three main parts of a geothermal HVAC system are the heat-pump unit, the liquid heat-exchange medium (open or closed loop), and the air-delivery system (ductwork). The heat pumps main components are the compressor, heat exchanger, air coil, blower motor and electrical controls. Earth-coupled geothermal heat pumps and systems can deliver a steady, even heating or cooling at optimal temperature and humidity. They work well with ventilation systems or with radiant heaters that circulate hot water under floors, producing an efficient, allergen-free warmth. But these highly efficient and reliable systems are best designed and installed by professionals. It is not recommended to make this a DIY project as these systems must meet specific requirements. Especially the piping laid out in the ground, or down to the ground water table, must be designed and installed correctly to ensure that your geothermal heat pump system works as intended. For more information about Geothermal Heat Pumps and how you can use them to heat and cool your home, or to obtain more geothermal energy information about the various Geothermal HVAC designs and systems available, or to explore the advantages and disadvantages of using heat pumps, then Click Here to order your copy from Amazon today about how Geothermal Heat Pumps can be used in the home. Drilling for the vertical system can lower the groundwater level and where with the deep earth probes if once the house is demolished? who pays that or just stay in the ground? Heat pumps are much more cost-effective then other conventional heating devices, and are also becoming more commonly used to heat swimming pools, and hot water for household use. A friend of mine has been thinking about getting a different heating system for his house for a while now, but he wasn’t sure what kind of system would be best. One thing that really stood out to me is that it can supply a steady stream of heating and cooling for humidity. Since it can get very humid here, it would be nice to know that you are going to keep things cool. Thank you for the nice comments. We will be adding various renewable energy articles to the site so heat pumps will be included.